This hasn’t been the front door of Oak Grove School for a long time. If you want to take a last look at Oak Grove School in rural North Albany, better make it quick. The building will be demolished shortly, to be replaced by a much bigger one that’s scheduled to be ready in the fall of 2019. The elementary school at 1500 Oak Grove Drive N.W. has been around since 1860, and the current building dates from 1948. Russ Allen, business director for Greater Albany Public Schools, told me that additions or other improvements were made in ’57, ’67, ’74, and again about 10 years ago. The original plan had been to remodel and enlarge Oak Grove again, but then the school board decided it was more economical and prudent to build a whole new school. 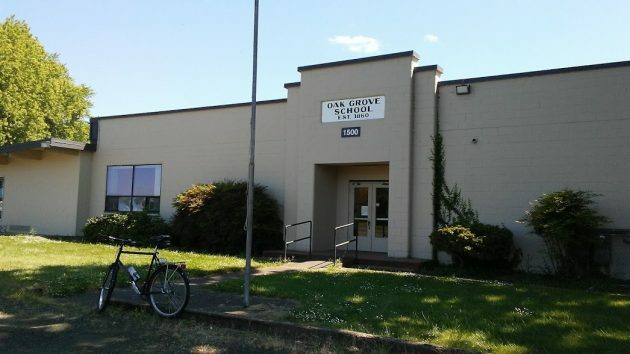 Gerding Builders of Corvallis, the low bidder, has been awarded the contract to oversee the Oak Grove replacement and has been getting bids from prospective contractors for different aspects of the work. Demolition and other site work are to start shortly after the last day of school, which is June 14. The board awarded a $2.16 million contract for that work last week. 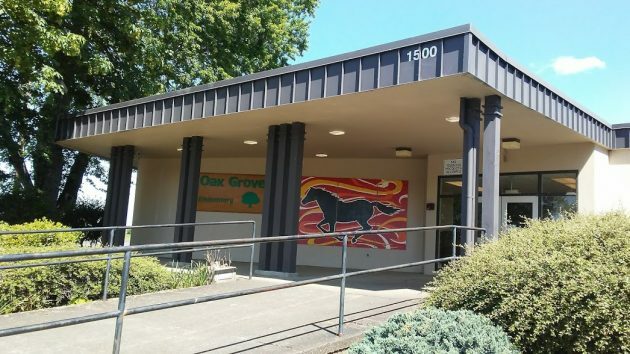 The overall Oak Grove replacement project — classrooms, administrative offices, gym, cafeteria, parking for staff and visitors, everything — has been estimated to cost around $26 million. The new school, with a two-story classroom wing, will have room for 400-500 pupils, compared to the current enrollment of about 290. You can look at the architects’ renderings on the school district website here. Like the rest of the buildings, this current main entrance will disappear. The only way you get a premium is to set an interest rate higher than necessary so the bonds sell at a premium. In my opinion the premium should be set aside and used to pay off the bonds otherwise the taxpayers are getting screwed as they only approved a bond issue of 159 million. The premium arose because the school district paid a higher interest rate than necessary to sell the bonds; therefore the premium should be used to pay back the bonds otherwise the taxpayers are getting screwed. So Hasso please address Al’s issue. Voters approved only 159M. Seems something smells like distortion/manipulation when voter did not approve 187M. Schools that do a poor job education now get more greedy. As I understand it, taxpayers got a break. We’ll have to pay off “only” $152 million, not $159 million. And because buyers were so eager to bid on these bonds that they paid more to get them, we get more projects than with the original bond amount authorized. What’s not to like? The premium comes because the taxpayers will have to pay back the premium because of a higher interest rate on the bonds than was necessary to sell them at par. Check it out with any bond expert. Don’t take my word. You apparently don’t like me posting but there are no free lunches in the world except those paid by the government. The taxpayers will be paying a higher interest rate than necessary to cover the premium the bond buyers paid.